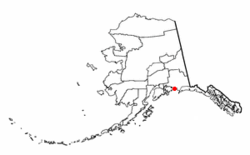 Cordova ( /kɔːrˈdoʊvə, ˈkɔːrdəvə/) is a small town located near the mouth of the Copper River in the Valdez-Cordova Census Area, Alaska, United States, at the head of Orca Inlet on the east side of Prince William Sound. The population was 2,239 at the 2010 census, down from 2,454 in 2000. Cordova was named Puerto Cordova by Spanish explorer Salvador Fidalgo in 1790. No roads connect Cordova to other Alaskan towns, so a plane or ferry is required to travel there. In the Exxon Valdez oil spill of March 1989, an oil tanker ran aground northwest of Cordova, heavily damaging ecology and fishing. It was cleaned up shortly after, but there are lingering effects, such as a lowered population of some birds. In March 1989 the Exxon Valdez oil tanker ran aground on Bligh Reef northwest of Cordova causing one of the most devastating environmental disasters in North America. The Exxon Valdez oil spill severely affected the area's salmon and herring populations leading to a recession of the local fishing-reliant economy as well as disrupting the general ecology of the area. After many years of litigation, 450 million dollars were awarded for compensatory and punitive damages. As of the census of 2000,  there were 2,454 people, 958 households, and 597 families residing in the city. The population density was 40.0 per square mile (15.4/km2). There are 1,099 housing units at an average density of 17.9 per square mile (6.9/km2). The racial makeup of the city was 71.11% White, 23.6% Native American, 10.07% Asian, 0.41% Black or African American, 1.34% from other races, and 6.72% from two or more races. Hispanic or Latino of any race were 3.06% of the population. Cordova is located within the Chugach National Forest at 60°32′34.1″N 145°45′36.59″W﻿ / ﻿60.542806°N 145.7601639°W﻿ / 60.542806; -145.7601639 (60.542805, −145.760164). According to the United States Census Bureau, the city has a total area of 75.6 square miles (196 km2), of which, 61.4 square miles (159 km2) of it is land and 14.3 square miles (37 km2) of it is water. The total area is 18.87% water. Copper River Wild Salmon Festival takes place in July at the Mt. Eyak ski area and includes various events. Salmon Jam Music Festival serves as one of the main events and a fund raiser for Cordova Arts, where local musicians perform followed by professional acts and takes place over the course of Friday and Saturday nights. Taste of Cordova, a wild food and Copper River salmon cook off, usually starts the events. Entries are made with a variety of wild, locally harvested foods and are judged by a panel of guest chefs and food writers. The Alaska Salmon Runs start Saturday morning and include a marathon, half marathon, 10k, 5k, and a 1-mile race on the Copper River Highway. Small Fry activities are educational events for children and families that take place during the races. The Cordova School District operates the schools in the community. Mt. Eccles elementary school is the only public primary education facility in Cordova and had an enrollment of 206 students in 2008. Public secondary education is served by a single combined junior and senior high school. The high school had an enrollment of 205 students in 2008. The Cordova School District has 26 employed teachers. Post secondary education is provided by the Prince William Sound College, a community campus of University of Alaska Anchorage. Despite being on the mainland, Cordova is only accessible via boat or aircraft, as there is no road connecting the town to any other town. It was previously accessible by railroad however the railway is no longer in use largely due to the 1964 Good Friday earthquake and the resulting destruction it caused to the Million Dollar Bridge. The longest road is the Copper River Highway which follows the old railbed of the Copper River and Northwestern Railway for 49.5 miles (79.7 km). The first 11 miles (17.7 km) east of Cordova is paved and the rest is gravel. As of the summer of 2011, vehicle traffic can only reach the 36 mile mark as changes in the river course washed out the 339 bridge. The following 13.5 miles may still be accessed via a river crossing by boat. Cars and trucks can be transported to Cordova by ferry. Regular ferry service is provided by the state owned, Alaska Marine Highway System to Valdez and Whittier with whistle stops (the ferry only stops if there are prior reservations) in Tatitlek and Chenega Bay. The M/V Aurora operates in Prince William Sound year round and the high-speed M/V Chenega operates the area in the summer. ^ 1996 Alaska Municipal Officials Directory. Juneau: Alaska Municipal League/ Alaska Department of Community and Regional Affairs. January 1996. p. 43. ^ Cordova Mun. Code[ permanent dead link], Alaska City Charter (2009). Retrieved April 8, 2010. ^ Cordova Mun. Code[ permanent dead link], Alaska City Charter, Article III (2009). Retrieved April 12, 2010. ^ Cordova Mun. Code[ permanent dead link], Title 5 (2009). Retrieved April 12, 2010. ^ FAA Airport Master Record for CDV ( Form 5010 PDF), effective October 10, 2008. ^ FAA Airport Master Record for CKU ( Form 5010 PDF), effective September 25, 2008.